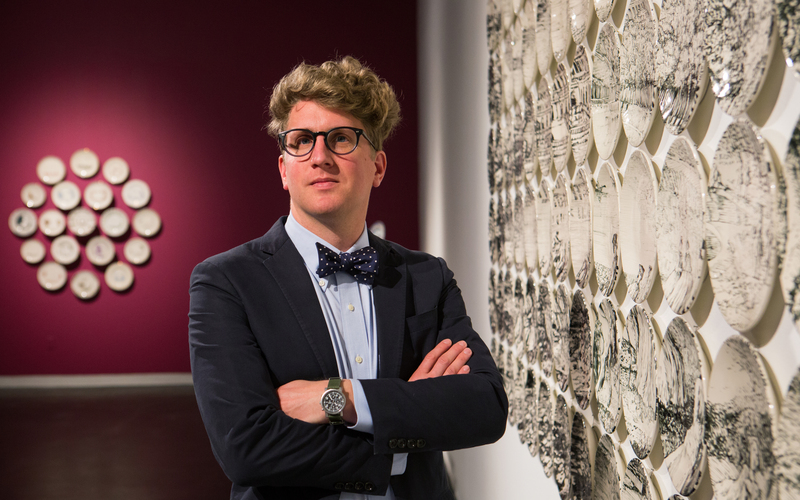 Join Perry Price, Executive Director of Houston Center for Contemporary Craft, for a look at the increasing permeability between the fields of contemporary craft and art in conjunction with the exhibition Nicolas Moufarrege: Recognize My Sign. Share in a discussion about the ways in which craft processes and materials are used as catalysts for material-centered thinking. This program is a gallery walk-through, to request an accessibility accommodation for this program, please e-mail fcleveland@camh.org as far in advance as possible. Light lunch provided. Perry A. Price is Executive Director of Houston Center for Contemporary Craft (HCCC) in Houston, Texas. Price is a scholar of contemporary studio craft, material culture, decorative arts, and design, and received a BA in the History of Art from the Johns Hopkins University and an MA in Museum Studies from the Cooperstown Graduate Program in Museum Studies, State University of New York Oneonta and the New York State Historical Association. Prior to joining the HCCC, he served as Director of Education for the American Craft Council, where he was responsible for developing and presenting programming and outreach providing thought leadership and cultivating critical thinking on the field of contemporary craft, and as Curator of Exhibitions and Collections for Fuller Craft Museum in Brockton, Massachusetts, where he developed and oversaw all aspects of the New England craft museum’s exhibitions and collections initiatives.